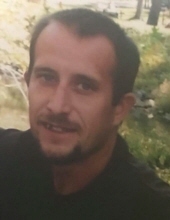 Wallace Otto Darkow Jr. 35 years old of rural Effingham, Illinois passed away on Thursday evening, July 5, 2018 at 10:00 PM as a result of an accident on Kaskaskia River in Shelby County, Illinois. Junior Darkow was born on July 30, 1982 in the John Moses US Air Force Base Hospital, Minot, North Dakota into the family of Wallace Sr. and Cathy Gulley-Darkow. During his younger years Junior spent most of his youth in Velva, North Dakota. He moved to Illinois in 1992 and attended Altamont Community High School. He was employed for over 20 years at Thies Painting & Hardwood Flooring in Effingham as a painter, carpenter, and craftsman. Junior leaves to mourn in his passing his: Father Wallace Darkow Sr. of Sawyer, North Dakota. Mother Cathy Gulley-Lane of Effingham. 2-Brothers: Jimmy Barr of Effingham and Randy Darkow of Vandalia, Illinois. 2-Sons: Brody and Riley Darkow. 2-Daughters: McKenzie and Summer Darkow. Step-Daughter: Makaela Kingery and granddaughter Esm’ee Kingery all of Effingham, Illinois. Special Friends: Bill and Judy Thies of Effingham. He was preceded in death by his Sister: Jamie England, Grandparents: Rue and Novita Gulley all of Effingham and Paul and Gloria Darkow of Currington, North Dakota. To send flowers or a remembrance gift to the family of Wallace Otto Darkow Jr, please visit our Tribute Store. Private Christian Burial Rites will be in the Wright Cemetery, near Mason, Illinois at a later date. "Email Address" would like to share the life celebration of Wallace Otto Darkow Jr. Click on the "link" to go to share a favorite memory or leave a condolence message for the family.